A delegation of Sudan, formed by directors of Kenana Sugar Company Limited, was in Brazil between 11-19 March, in order to get closer to Brazilian technology for processing of sugar cane. Considered the largest Sugar group in Sudan, representatives attended meetings and commercial visits and techniques in dozens of companies in the sector in Brazil. The visit is part of a major expansion plan of the government of Sudan for cultivating sugar cane, and producing ethanol. 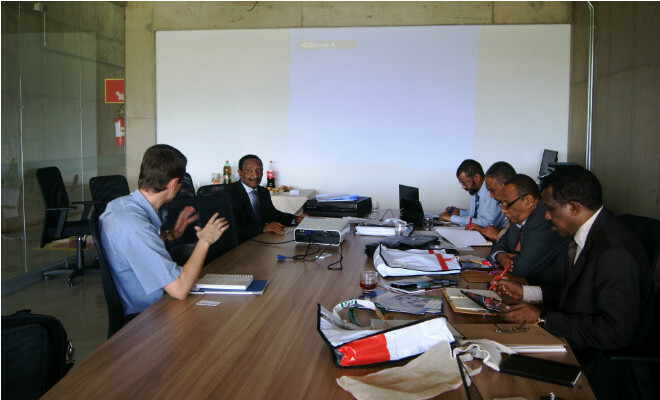 The meetings took place in the Parque Tecnológico in Piracicaba where the directors of the Sudanese group was greeted by executive director of Apla (Local Productive Arrangement Alcohol), Flavio Castelar. “This is one of the first meetings, the fruit of the cooperation agreement signed between Apla and Kenana in January 2013 to develop actions aiming to introduce Brazilian technologies in Sudan and other African countries,” he says. Potential of ethanol from Brazil is discussed in the U.S.